A memoir, written with warmth and ease, of the author's Soviet background as expressed through a series of meals representing stages of Russian history: a personal and historical tale as infinitely layered, complex and redolent as the legendary kulebiaka (see p. 12-13!). Born in 1963, in an era of bread shortages, Anya grew up in a communal Moscow apartment where eighteen families shared one kitchen. She sang odes to Lenin, black-marketeered Juicy Fruit gum at school, watched her father brew moonshine, and, like most Soviet citizens, longed for a taste of the mythical West. It was a life by turns absurd, naively joyous, and melancholy--and ultimately intolerable to her anti-Soviet mother, Larisa. When Anya was ten, she and Larisa fled the political repression of Brezhnev-era Russia, arriving in Philadelphia with no winter coats and no right of return. Now Anya occupies two parallel food universes: one where she writes about four-star restaurants, the other where a taste of humble "kolbasa" transports her back to her scarlet-blazed socialist past. To bring that past to life, Anya and her mother decide to eat and cook their way through every decade of the Soviet experience. Through these meals, and through the tales of three generations of her family, Anya tells the intimate yet epic story of life in the USSR. Wildly inventive and slyly witty, "Mastering the Art of Soviet Cooking" is that rare book that stirs our souls and our senses. ANYA VON BREMZEN is one of the most accomplished food writers of her generation: the winner of three James Beard awards; a contributing editor at "Travel + Leisure" magazine; and the author of five acclaimed cookbooks, among them "The New Spanish Table," "The Greatest Dishes: Around the World in 80 Recipes," and "Please to the Table: The Russian Cookbook" (coauthored by John Welchman). She also contributes regularly to "Food & Wine" and "Saveur" and has written for "The New Yorker, Departures," and the "Los Angeles Times." She divides her time between New York City and Istanbul. "The culinary memoir has lately evolved into a genre of its own, what is now known as a 'foodoir.' But Anya von Bremzen is a better writer than most of the genre's practitioners, as this delectable book, which tells the story of postrevolutionary Russia through the prism of one family's meals, amply demonstrates...Von Bremzen moves artfully between historical longshots (minefields being cleared 'by sending troops attacking across them') and intimate details, like her schoolgirl mother’s lunch ration of podushechka, a candy the size of a fingernail...The descriptions of meals are delightful." "Von Bremzen ladles out a rich, zesty history of family life in the USSR conveyed through food and meals." "Mastering the Art of Soviet Cooking turns a bittersweet eye and an intelligent heart on Soviet history through food...Beautifully told." "Von Bremzen knows how to tell a story – poignant, funny, but never lacking." "Brilliant...a lyrical memoir and multifaceted reflection on Soviet (and American) cultures." "An ambitious food memoir that is also a meticulously researched history of the Soviet Union...a meditation on culinary nostalgia." "Anya von Bremzen's saga of growing up in a superpower always on the verge of starvation is both rollicking and heartrending." "A delicious narrative of memory and cuisine in 20th-century Soviet Union. In Mastering the Art of Soviet Cooking, [von Bremzen] follows in the footsteps of Nigel Slater's Toast and Anthony Bourdain's Kitchen Confidential: memoirs about life, love and food that linger long after the last page is turned. Her tale is a nostalgia-laden compendium of madeleine moments...A banquet of anecdote that brings an entire history to life with intimacy, candor and glorious color." 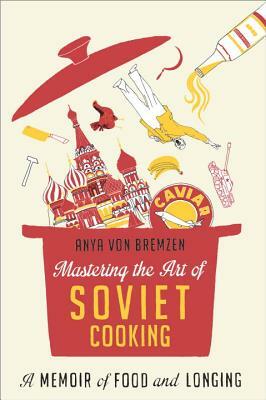 "Mastering the Art of Soviet Cooking is a painstakingly researched and beautifully written cultural history but also the best kind of memoir: one with a self-aware narrator who has mastered the art of not taking herself entirely seriously...A breathtaking balancing act...Von Bremzen is as much a virtuoso in her writing as her mother is in her cooking." "One-of-a-kind...A nostalgically anti-nostalgic tribute to 20th-century life and food in the land once known as the Soviet Union...Breathtaking feats of raconteurial skill...Mastering the Art of Soviet Cooking is not only a magic tablecloth, it’s a magic carpet that revisits the roads and lanes of the former Soyuz, surveying the tales of hardship and hardwon joys of von Bremzen’s relatives and the Russian people." "Russian treasures! You never know when they're going to pop up. My heart gladdened at the sight of Anya Von Bremzen's book. This is history at a personal level, the kitchen table." "Splendid...[Von Bremzen] describes the U.S.S.R. with the eyes of a betrayed lover—alternately despairing, dismayed, aghast and yet, somehow...with love." "At once harrowing and funny as hell, an epic history told through kotleti (Soviet hamburgers) and contraband Coca-Cola." "There is no book quite like Mastering the Art of Soviet Cooking...Through all of this lovely and moving memoir's good humor, bittersweet reminiscences, and gorgeous evocations of food, there hangs the 'toska,' the Russian nostalgic 'ache,' of Anya and Larisa's conflicted feelings about the past." "[T]his is no simple food memoir. Von Bremzen situates every dish she mentions in its historical, cultural and literary context, simultaneously delving into her own fascinating family history. Her book is an education through the senses, written with humor, affection and a no-nonsense view of her often baffling native land." "A masterful telling of Soviet history through the eyes of a cook... a collection of fantastic stories that you hear only when sitting on a bar stool or in a church pew. Von Bremzen offers remarkable — and personal — insight about the Cold War, its politics, military strategy and the human suffering that accompanied it." "[Von Bremzen] is a profoundly gifted writer, able to lace information with observation, observation with wit...[This book] feels rather like a novel, richly populated and filled with deft dialogue, yet it's also crammed full of history. Imagine Robert Caro crossed with a Chekhov play, if it were funny." "Moving...funny...fascinating...Soul-stirring for any emigrant to read, Mastering the Art of Soviet Cooking is a beautifully written tale of heartbreak and ultimately happiness." "Splendid...Von Bremzen is a gifted storyteller who writes with an easy elegance. In Mastering the Art of Soviet Cooking, she achieves a perfect balance between her narrative’s varied ingredients. The result: a feast for readers." "Through a kaleidoscopic mix of family life, politics, history, and jokes, Von Bremzen evokes in her book a whole Soviet-era world of deprivation and delight." "The funniest and truest book I've read about Russia in years. Ms. von Bremzen had the brilliant idea of transporting us back to the Soviet era of her youth by way of its hilarious, soulful, mayonnaise-laden, doctrinally-approved cuisine. This is both an important book and a delight." "I don’t think there’s ever been a book quite like this; I couldn’t put it down. Warm, smart and completely engaging, this food-forward journey through Soviet history could only have been written by someone who was there. Part memoir, part cookbook, part social history, this gripping account of Anya von Bremzen’s relationship with the country she fled as a young girl is also an unsentimental, but deeply loving tribute to her mother. Unique and remarkable, this is a book you won't forget." "A delicious, intelligent book. When I read it, I can taste the food but also the melancholy, tragedy, and absurdity that went into every bit of pastry and borscht." "I have delighted in Anya von Bremzen’s writing for decades. But her prose is at its tangiest, richest, and tastiest in these pages, when she writes about her childhood in the USSR. Mastering the Art of Soviet Cooking is as much a history of Soviet life as it is a personal story. Both narratives are provocative and delicious, and both are worth telling your children." "Three cheers for Anya Von Bremzen's poignant, vivid, often hilarious book about trying to survive—and have a square meal—in the last decades of the Soviet Union. The author's acute political perceptiveness, mordant wit and notable culinary expertise keep the reader delightfully engaged throughout." "Anya's description of the saltiness in vobla is as poignant and image-filled as her reflection on a life that started out one way, but ended up in a better place by chance and fate. Her experience of growing up a child of two different worlds tells the beautiful tale of so many American immigrants." "This is much more than a memoir or an extended meditation on food and longing: this is history at its best, accessed through the kitchen door. Written with verve and seasoned with perfect doses of that irony that communist societies excel at cultivating, this book is a rare and delightful treat, as much of a page-turner as the best of novels and as enlightening an introduction to Soviet history as one could ever hope to find. Anya Von Bremzen proves with admirable flair that the adage “you are what you eat” applies not only to individuals and families, but also to entire nations, and that cookbooks may indeed be the most translucent of windows to the soul." "Mastering the Art of Soviet Cooking is a monumental but deeply human book that reads like a great Russian novel, filled with dark humor and nostalgia. It opens up an entire universe, teaching us about the many deep meanings of food: cultural, political, social, historical, personal." "A fascinating, colorful and at times oddly tender look at the history of the former Soviet Union as seen through Anya von Bremzen’s intimate recollections of food--including foods never eaten or never to be sampled again. Von Bremzen does a soulful job of capturing Russians’ ‘complicated and even tortured relationship with food.’ What emerges is her own complicated yet loving relationship to the culture she and her mother willingly left behind, but could never quite abandon." "Anya von Bremzen describes the foods of her past powerfully, poetically, and with a wicked sense of humor. Anyone can make a fancy layer cake sound delicious. To invoke an entire culture and era through an intimate story about a salad or soup--that's taking food writing to a whole different level." "Here’s a surprise: a wry account of how the Soviet Union tasted. Larisa Frumkina, the mother of the author, the daughter of a top military intelligence officer (endlessly, brilliantly resourceful, she appears to come straight out of Russian literature), becomes an émigré, a Pathmark shopper, and a co-conspirator with her daughter in Soviet food nostalgia and self-discovery. A wink, a laugh, a transgression, a sweet sad life over the generations that throws an epic history into a new light." "One of the most unexpectedly pleasurable reads this year. Beyond the innately voyeuristic thrill of reading about the details of Soviet life, Mastering is funny, intimate, evocative and rueful." "Celebrated food writer Von Bremzen pulls back the curtain on Soviet life in this sweeping, multigenerational memoir." "Most Westerners imagine Stalinist Russia as a food desert...Although this view has plenty of truth, it lacks nuance and humanity, as von Bremzen reveals so eloquently in this memoir...[Von Bremzen] shows the personal side of Soviet life, recounting the terror of war and secret police as well as the power of human resilience."